﻿ Best Price on Luna Lodge in Carate + Reviews! Surrounded by tropical rainforest, with waterfalls and nature, Luna Lodge features incredible nature tours, yoga, spa treatments, an organic swimming pool and free Wi-Fi in public areas. This sustainable property is run by hydro energy. The property offers private bathrooms with hot water, free toiletries and panoramic views of the surroundings. The bungalows and tents have private decks and the rooms have a terrace. Electricity is available 24 hours a day. 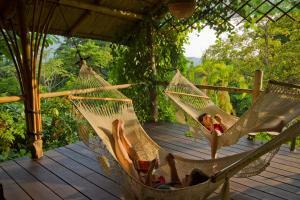 Activities such as tours in the rainforest, bird watching, kayaking and horseback riding on the beach can be arranged. Yoga lessons and spa treatments are also available. The property offers tour guides to take guests to interesting touristic spots like Corcovado National Park. Luna Lodge is a 10-minute drive from Carate Local Airport, 2 hours' drive from Puerto Jimenez Domestic Airport. Please note drinks are not included in the menu. Please note children 5 years and older are welcome, the hotel is not recommended for children under 5 years of age. This property is accessible by an unpaved road, which might not be suitable for some vehicles.